As you may know I want to answer what it is that stops mankind from going to Mars. The only solution that currently may bring us to another planet is Spacex's BFR, yet their design is being disputed as inefficient for dead cargo transportation. The other option that can compete in terms of efficiency with direct payload transport to Mars is disconnecting one-way one-shot lander with cargo at Mars orbit as this solution makes the landed part of vessel lighter. This way the transporting spacecraft may also be lighter (no need to sustain heavy loads on ascent), can be designed with high Isp engines and does not need a heavy heat shield. I cannot find reason to discard this proposal so I created a page where such design will be evaluated: spacetechs.ovh. Currently the problem with this design is the dv needed to park in LMO. This may be solved by aerobraking maneuver, so based on data from internet i written a simple calculator that simulates this procedure. Simulation was calibrated with data on mars reconnaissance orbiter and shows good results. The periphrasis altitude that allows to park heavy (250t+ mass) ship in orbit in 5+ months seems to be somewhere between 65km to 70km (30 km lower than in MRO mission). Now, the next step is designing proper heat protection and here is the subject. Does anyone know a proper software or person that can calculate the temperature on the spacecraft surface given model (shape), velocity and the Mars(!) atmosphere density? I posted a crude ballistic reentry model long ago on "exrocketman". This was a 2-D straight-line trajectory warhead entry model from the 1950's, based on atmospheric scale heights. It has a convective heating model in it, that I corrected and made consistent. This article is located at http://exrocketman.blogspot.com, dated 7-14-2012, and titled "Back-of-the-Envelope Entry Model". The convective heating model is located in the subsection titled "Convective Heating Model". Heat flux q = k (density/nose radius)^0.5 V^3. For metric units, q = W/sq.cm, nose radius = m, velocity V = m/s, density = kg/cu.m, and I had to carefully convert a US customary k value to those metric units: metric k = 1.748 E-8. This gives the heating right at the stagnation point. Nose radius is the surface radius of curvature right near the stagnation zone. Everywhere else the heating is a lot less. How that heating flux varies away from the stagnation zone depends upon the shape, entirely empirically. I did not research or model that, figuring if the center of a conventional capsule heat shield can survive stagnation heating, the rest will do that well or better. I calculate this stagnation zone heating rate as a function of time during the descent and integrate that numerically to find the total stagnation zone absorbed heat that must be dealt with. That procedure replaces the mis-reported closed-form equations for peak heating rate and total heat absorbed, which I found very faulty, as reported. In the equation, the atmospheric density is that at altitude, not surface. Velocity is the varying flight velocity of the entering object. This equation models convective heating only, no radiation is estimated. But the "rule-of-thumb" is that radiation does not dominate below about 10 km/s speeds. So maybe double your answer if you are close to that. This ballistic trajectory model of mine is unsuitable for the repeated aerobraking passes you seem to be interested in. But the convective stagnation heat flux model should apply anyway, to whatever your flight trajectory history actually looks like. I joined the Mars Society in 1999, one year after it's founding. Members where extremely ambitious at that time. The founding charter called for sending a Mars Society probe to Mars, hitch-hiking on a NASA mission. NASA's Deep Space One just finished, so I proposed we send a Society mission of our own. The idea was access to LEO via Shuttle, in a Get-away-special. Then slowly travel to Mars using an ion engine. I got detailed reports on the NSTAR ion engine from the lead engineer who designed it. As he put it, everything allowed to be exported outside the US, practically everything short of the blueprints. I setup an online poll to vote what this mission should be: the majority voted for a weather balloon. Turned out there were 3 other groups within the Society that wanted to do that; I got them all to work together. One member was an electrical engineer who designed power supplies for Cisco; he wanted to design the power supply for our mission. The Spain chapter wanted to build the balloon. I worked for a company that developed software for the QNX operating system, the same system as the vision system for CanadArm, and later used by BlackBerry. Dr Zubrin himself got a contract to build a prototype balloon for Mars. JPL had a weather balloon take a sealed canister so high into Earth's atmosphere that the pressure and temperature were the same as Mars. The canister was then opened, inflating the balloon. I proposed we use the same system; using Dr Zubrin's work for a Society mission to Mars. Another member worked for a US military contractor. They bid to provide a propellant tank for the bus for Minuteman missiles to carry Multiple Re-entry Vehicles. This tank was a titanium alloy designed to curl upon itself as propellant is drained, providing pressurized propellant. He wanted his firm to provide the propellant tank for our Mars Society mission. I found a commercial corporation in California that made space hardened electronics. I talked to the manager of the Small Shuttle Payload Program. He said Get-away Special was a barrel about the size of an oil barrel, could carry up to 200 pounds, and the greatest astronaut involvement is to flick one switch to turn it on. To deploy a satellite, it requires an ejection mechanism, which was available; however, maximum payload mass was 150 pounds. Cost was $8,000 for a US education institution, or $27,000 for anyone else. But he apologized, saying senior NASA management didn't want to compete with commercial launch services, so if a satellite was deployed this way the cost was $2 million. He also said if a NASA "agency" (cost center) sponsored our project, we would get a free ride on the Shuttle. And he gave the form number we would have to get the NASA center to sign. At the time we had a couple senior NASA personnel on the board of directors. When I asked Dr. Zubrin permission to make this a formal Mars Society project, he said no. I stopped pushing the project at that point, and without me organizing it, the project immediately fell apart. The point is another individual asked me to join our project. He was completing a Ph.D. in aerospace engineering specializing in heat shields and aeroshells. This individual wanted to design the aeroshell for our mission to enter Mars atmosphere. Of course I said yes! He moved on when our project fell apart. He would be the ideal person to answer your question, but he now works for SpaceX so this may be a conflict of interest. His name is Paul Wooster. It is to bad that Mars Society's leader did not see a value to getting there own name out there for going to mars on a shoe string. This would have become a fund generator for getting more missions. RobertDyck, it is very bad that you did not complete that project. I would like to see a small private community initiative in space as this would surly rise the interest in space industry. Does anyone posses the copy of this LAURA program or know of a alternative similar software? I'm assuming your aerobraking idea involves elliptical orbits with perigee down in the atmosphere. Repeated passes subtract energy by drag work, reducing apogee until you fall entirely within the atmosphere and enter, or until you modify the orbit with an apogee burn that raises perigee out of the atmosphere. If that scenario is correct, you have some idea of the perigee altitude, and you can calculate for each pass the perigee speed from orbital mechanics. That's the peak speed during aerobrake hypersonics. That's where the heating is the highest. You can get "into the ballpark" with my simple 1950's correlation for stagnation point heating rate at that max heating point. If your heat shield scheme is adequate there, it'll be adequate at other points in the trajectory, and away from the stagnation point. Use some sort of hand calculation like that to set up your design procedure, so that you don't have to make so many runs with the fancy computer codes. Those take much effort to set up and interpret, and computer stuff ALWAYS runs the risk of "garbage-in/garbage-out". Your hand-calculation results help you recognize, and ditch, the garbage. That's just some "smarts" from ol' Doc Johnson's "school of hard knocks". During the space flight the ship is in some sort of static thermal state. Then on the atmospheric entry the ship starts generating heat - the lower the altitude the more heat is generated. At this time generated heat rises the temperature of the shield. After the perigee heat generation starts to fall but temperature still goes up (if the radiation is not strong enough yet). This last until the ship leaves the atmosphere- then the accumulated heat radiates into space. Finally the ship is back to the original state. Firstly, the temperature. After perigee, when the shield radiation exceeds the heat generated by atmosphere the temperature starts to fall and so this is the max that the material needs to withstand. Secondly, the heat leak. While the ship is not in it original state, the heat passes through shield. Total energy that goes in cannot rise the internal temperature by more than several degrees, so the shields needs to have a high heat conductivity resistance. This part is quite tricky. The heat that the ship absorbs is (atm generated heat) - (radiated heat). The radiated heat is tied to shield surface temperature and high resistance makes the shield hot faster (as the heat cannot go in). Also if the external material has a big heat capacity and low conductivity there is a lot of time before the internal surface of the shield starts radiating the heat and as the whole pass last somewhere about 10 minutes the unsteady heat analysis for heat transfer may be of use. Can you calculate this by hand? By hand, you can only get into the ballpark. You cannot get a precise answer. Steady state you can investigate by hand. Transient effects require a finite element approach, even if it is only one-dimensional. Now, there is an old re-entry engineer's rule-of-thumb that the effective plasma temperature in degrees K is numerically equal to the object flight velocity in m/s. If 6000 m/s, the plasma is ~ 6000 K. Below around Mach 7 (local), you can use ideal gas compressible flow to estimate gas temperature. Above Mach 7 (local), the rule-of-thumb is better. It is not right, but it really is "in the ballpark". The plasma is exactly that, no longer atmospheric gas. Properties are quite different from the unheated gas, including molecular weight. Whatever the effective gas or plasma temperature is, that is as high as your surface temperature could possibly be, because when equal, the temperature difference that drives heat transfer rates zeroes. There's a lot of effects, but usually, convection to the surface, radiation from the surface, and conduction into the interior, are the dominant effects. Above something near 9 or 10 km/s velocity, radiation from the plasma to the surface gets significant, and quickly dominant at higher speeds still. That is not broad-band radiation, it is discrete line emission. The effective broad-band emissivity is quite low, on the order of 1%. You have to have quite the high effective temperature before the T^4 effect overwhelms the extreme low emissivity. Solids contaminating the slipstream from the ablating heat shield do act to raise the effective emissivity. It takes quite a lot of them to have a significant effect, though. Balancing convective input against radiative output and conduction into the interior, steady state, is something a hand calculation can do. Flight conditions set your convective input. Surface temperature sets your re-radiative output, and simple multilayer conduction, from the surface temperature to an interior temperature, sets that heat flow. You iterate surface temperatures, until the three heat flows equilibriate. That's nothing but iterative spreadsheet work. Good default values for surface emissivity would be ~0.20 for something "white", meaning reflective but not very emissive; and ~0.80 for something "black", meaning not very reflective at all, but fairly efficiently emissive. If the heat shield only sees deep space as its environment, 4 K is a good sink temperature for the radiation from the surface. But you are close to an astronomical body if you are doing aerobraking. Use its "typical" warmer-side surface temperature as your heat sink temperature. For Earth, that's about 300 K. Mars is only a tad cooler. The EDL have been talked of in about 3 pages of topics that its meantioned in. I usually post lots on technical links in topics to aid in getting to the numbers. NASA's planning for Mars human missions - interesting stuff. I think the information you're after is ITAR-controlled, but you may want to contact Langley just to check. I suspect a lot of the required EDL development work is being held up by the twin funding black holes known as SLS and Orion. Maybe Congress will eventually detect the gravitational wave as they merge and put the money to better use. One can always dream. I am not thinking about landing. Just aerobraking, then orbit stabilization. The temperatures to withstand are much lower than the ones in your solution. Spacecraft to park in LMO needs to change velocity by 1600m/s. Aerobrake is kinetic to thermal energy transformation. Kinetic Energy in single pass is E=1/2*m*v2. Spacecraft mass is equal to 300t, so E = 1896.3kJ. The temperature can be calculated as dT = Q/(m*cp). The ship is covered by 0.001m thick aluminium plates. Total area covered equals 1700m2. Aluminium density is 2700kg/m3, so total mass equals 4.59t. Cp for aluminium = 910J/kg*K.
Ship frontal area (nose + solar panels as airbrakes) = 135m2. Cover mass on this part = 364.5kg. dT for the frontal area: 5.71K. Too good to be true. Any suggestions? I don’t believe you actually tried my solution, or you would not think the temperatures it predicts were too high. I think you just ran the easiest thing there is to do: calculating plasma sheath temperature. The stagnation point surface temperature is less than the plasma sheath temperature, because there is re-radiation heat flux and thermal conduction heat flux, balancing the convective input heat flux. The equilibrium stagnation point surface temperature is somewhere between the plasma sheath temperature and the interior temperature, essentially Earth temperature ~300 K.
And that’s steady-state. On a transient, it is cooler yet. Plus, the other heating rates and temperatures away from stagnation are cooler still. An example: space shuttle nose cap midway through its re-entry from orbit. That would be flight near 4 km/s at about 45 km altitude. The nose cap has a radius of curvature somewhere in the vicinity of 1 m. Air density at that altitude is about 0.001454 times that at sea level. The plasma sheath temperature estimates as 4000 K.
I calculate from the old correlation a stagnation point heating rate of 46 or 47 W/sq.cm. I didn’t actually converge a full model, but I do get a re-radiative heat flow near 40-something W/sq.cm at a surface temperature nearer 1800-1900 K. That’s “near enough to balance”. There’s also some conduction into the interior, which I didn’t even calculate. So, somewhere close to that 1800-1900 K figure, or maybe a bit lower still, is the actual model equilibrium point. That’s a lot colder than the plasma sheath temperature, at conditions harsher (higher speed and lower altitude) than your aerobraking min altitude point. Plus, on a transient, the stagnation zone surface temperature would be even lower. And the other temperatures are substantially lower still, away from stagnation zones. My crude model does not predict that. 1800-1900 K is within the capability of carbon-carbon, but not alumino-silicate low-density ceramic tiles. Those crack from a solid phase transition at about 1480 K, with an actual meltpoint of 2090 K. That’s why the nose cap and leading edges were made of carbon-carbon, not the ceramic tile. On the belly and bottom of the wing, shuttle temperatures are below 1400 K, assuming a highly emissive surface and no conduction, and using a different convection model. That’s within the range of black-coated low-density almino-silicate shuttle tiles. They efficiently re-radiate the local convection, with essentially zero conduction. On the sides, inefficient re-radiation from white tiles was good enough to stay below 1400 K.
My idiotically-crude and ancient model gets me into the ballpark on the shuttle nose. It ought to work for you, too. But you do have to run the iterative equilibrium procedure, and not just calculate one number from one equation. As for kinetic to thermal, I'm not sure, but I think there's a error there somewhere. It's worth checking, anyway. The change in kinetic energy is what gets converted to heat. The change in kinetic energy is not 0.5 m (dV)^2, it is 0.5 m (v2^2 - V1^2), where V2 - dV = V1, and dV is the velocity change that you indicated. These V2 and V1 velocities are the perigee orbital velocities. On Mars, they fall somewhere between escape at 5 km/s and orbital at 3.5 km/s. There is also at least a little bit of re-radiation of some of the energy received from convection. I saw no sign of that in your calculation. Edit: and, I believe that not all the kinetic energy reduced by drag will be absorbed into only the spacecraft. Some of it will go into the local atmosphere, most of it into the wake, where all the dissipative vortex activity is. Way too many unknown things there. All in all, you'd be better off with a convective heating correlation at your perigee speed and altitude. And by balancing the energy flows to and from the surface of the spacecraft. To: convective heating. From: re-radiation, and thermal conduction into the interior. Let the reductions in temperature for the transient effects be your safety margin. If you can survive the worst case steady-state, you're good to go. Use the stagnation on the windward side, and neglect the leeward side. That'll get you into the ballpark. Sorry for not finishing my last post as I fell a sleep but here is a bit more towards the requested topic area. The trouble with mars atmosphere is that it varies greatly with the seasons and day versus night side of the planet for atmosheric thickness at a specific altitude above mars surface. Aero-braking or capture relies on surface area to drag on appredicted line through the atmospher to which if its quite dusty will change how the density and abrasive the path will be. Other things that change the mission is the planned surface area of the heat shield and mass of the ship as well. To which the heat loading is a function of the area to materials used.With the remaining part of the equation is the orbital mechanics, gravity and the exiting speed after passing through the atmosphere. This surface area and time in the atmosphere plus mass is where we start to look at shape to see if glide and banking and spiraling can also slow the vehicle as desired. The equations may be outside of my math capability but that does not mean it is for others. Going to mars will utilize the various rovers and orbitors to gather information to change the course as it gets closer to target mars. If you look in the Justus & Braun report on Mars atmosphere characteristics to support EDL, you find out that there are very large variations in density at all altitudes with day vs night, season, latitude, and longitude. These are roughly factor of 2 variations, unlike Earth or any other atmosphere we have characterized. That report gives average conditions, but they recommend using the site and season-tailored MarsGRAM models instead of average conditions. In that respect, Mars seems to be unique among the places with atmospheres. Variations on that scale make the outcome of aerobraking schemes quite unpredictable. Not just for EDL but also for repeat-pass aerobraking. That is why demonstrating repeat-pass aerobraking with a satellite at Earth is necessary but NOT sufficient for using repeat-pass aerobraking at Mars. Anywhere else, it would seem, but not Mars. The number of passes, and the effect each has on your velocity, are just not sufficiently predictable, especially for a manned mission, where too long will deplete life support supplies. This technique will have to be tried with an unmanned item at Mars first. And that item will have to be autonomously "intelligent" enough to adapt successfully to wildly-varying results as the atmosphere varies. Indeed, getting slowed below escape on the first pass is critical. If that doesn't work, you are lost in space beyond any possible salvage. Anything below escape is "capture" yes, but if it is still close to escape at periapsis, it could take many more months than you planned to reduce your apoapsis altitude, due to the very long periods of such extremely elongated elliptical orbits. Not to mention the risks of being tugged out of that orbit by Jupiter. Those are the risks and the requirements. Yes, it really can be done. No, it is not as easy as it first sounds. It's got to be tried here first, but like I already said, having the technique work here is necessary but NOT sufficient to just use it at Mars. That atmosphere is just too wildly variable there. We need experience dealing with that before we risk lives on it. We do not have such experience yet. It's an ethical thing as much as a technical thing. The real trick for Mars Orbit Insertion is not to have a great amount of speed in the first places as to be able to be captured by the planets gravity. Mars Express mission approached Mars at a speed of 5.07 kilometers per second, and at a distance of 523.2 kilometers (325.1 miles) from the surface of Mars, insertion "burn," 264.4 kilograms of propellant (582.9 pounds) of hydrazine fuel and nitrogen tetroxide oxidizer that will mix in the controlled combustion of the engine firing represent about 25% of the weight of the entire spacecraft. The engine provides 414 newtons, or 93 pounds of thrust. Mars Express will change by .804 kilometers per second or 1797.7 miles per hour. The 34-minute burn will reduce the spacecraft's speed, relative to Mars, to 4.27 kilometers per second, or 9543.5 miles per hour. The capture orbit was highly elliptical. The closest the spacecraft came to Mars in this orbit (the periapsis) was 300 kilometers (180 miles). The farthest away it traveled (its apoapsis) was 45,000 kilometers (28,000 miles). The orbiter took 35 hours to move completely around the capture orbit. The 25% of the total mass of the ship is alot on a manned mission. That is why you are looking to use the atmpsheric diving to slow the ship without using fuel. GW Johnson, SpaceNut - thank you for the help provided. I corrected the error in the energy equation used for estimating power needed for aerobrake. I know this is not a 1:1 kinetic to craft thermal conversion but it gives a good perspective for comparing light or heavy spacecraft aerobrake vs heat protection in landing or aerocapture. GW J. I dismissed your proposition not just for the off charts values that it gave (it was probably for my wrong unit conversion), but mostly for i was unable to locate the stagnation point in MRO craft. Now, as i did more reading on the subject and examined the data provided by SpaceNut i incorporated this equation in my software written to do the calculations. The numbers obtained from equations seem to be within the same magnitude that those given in SpaceNut's pdfs (but still i cannot apply the results for MRO). The problem is the data in the publication do not agree with outputs from the equations. Can i inquiry how one should calculate the ballistic coefficient beta? I mean exactly step by step solution with numbers from the article since any given mass, area or drag coefficient cannot produce published results. (beta = 66.4 kg/m2, 302kg/m2). The results are ok, but i am aware that this is for the very rough estimates. claims that the MARS-GRAM may be obtained free of charge, yet i cannot find any existing copy. As for the ethical issues, I am trying to evaluate an unmanned(!) cargo delivery system for heavy loads to Mars orbit or surface. NO HUMANS ON BOARD. If BFR can land on Mars and withstand the reentry heat then aerobrake should not be a problem for a similar design. The wildly variable Mars atmosphere is not an issue. The BFR must be designed to land in even most hostile condition two times (once on earth). Compare the energy difference between the landing and aerocapture and then divide the rest by 450. This will not give you the exact value but look at the difference. The trajectory is problematic, but was done before. Is not like you need to do exactly 450 orbits. Just do the almost perfect correction on the first and last ones. You would need to do a very big mistake to crash the ship aiming at perigee that reduces dv by 3.6m/s, and you can afford to do a more than necessary initial brake since your heat shield based on BFR design allows it. This is not as agressive but requires more than the MRO. This is a game changer for mars. Exploring the Solar System? you may need to pack an umbrella. ADEPT is a foldable device that opens to make a round, rigid heat shield, called an aeroshell. ADEPT's first flight test is scheduled for Sept. 12 from Spaceport America in New Mexico aboard an UP Aerospace suborbital SpaceLoft rocket. ADEPT will launch in a stowed configuration, resembling a folded umbrella, and then separate from the rocket in space and unfold 60 miles above Earth. The test will last about 15 minutes from launch to Earth return. The peak speed during the test is expected to be three times the speed of sound, about 2,300 miles per hour. That is not fast enough to generate significant heat during descent, but the purpose of the test is to observe the initial sequence of ADEPT's deployment and assess aerodynamic stability while the heat shield enters Earth's atmosphere and falls to the recovery site. "Carbon fabric has been the major recent breakthrough enabling this technology, as it utilizes pure carbon yarns that are woven three-dimensionally to give you a very durable surface," said Wercinski. "Carbon is a wonderful material for high temperature applications." 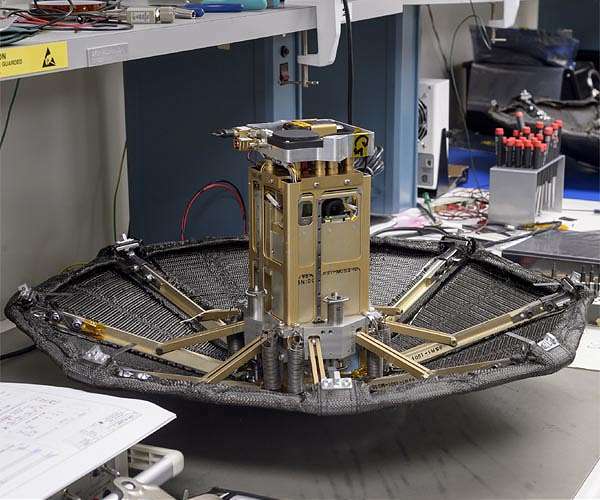 The next steps for ADEPT are to develop and conduct a test for an Earth entry at higher "orbital" speeds, roughly 17,000 miles per hour, to support maturing the technology with an eye towards Venus, Mars or Titan, and also returning lunar samples back to Earth. How much heating you get depends upon how deep into the atmosphere you go; in a word, the density at that altitude. The MRO didn't go very deep, which shows in its shape and construction. To capture reliably in spite of factor-2 uncertainty means you must go deeper on the first pass. Use the Justus and Braun reference for Mars atmosphere average conditions, not the Glenn Research Center model. The Glenn model is accurate near the surface, but way, way off at high altitude. Figure it for average conditions with Justus and Braun, then check to see if it still works at half, and twice, the density. If it does, you're good to go. I've got some of the Justus and Braun data posted somewhere over at "exrocketman". Look in 2012, June 30, titled "Atmosphere Models for Earth Mars and Titan". I had posted the Glenn model June 24, 2012, but soon found the better model. The two articles are so marked: Justus and Braun is better. I think the proper way to say that is "this is a FUTURE game-changer for Mars". This is a technology very early in flight testing, nowhere near ready for general application. But if the development testing goes well, and I think it might, it really is a game-changer. There is also the inflatable version of the same idea, also very, very early in testing. I think it flew once barely supersonically, out near Hawaii. These are ways to get a low ballistic coefficient with a big mass, in spite of the square-cube scaling laws. Ballistic coefficient, in the metric units that most folks use, is object mass, kg, divided by the product of frontal blockage area, sq.m, and drag coefficient (referenced to frontal blockage area). Hypersonically, that drag coefficient is very nearly constant across Mach number. For the space capsule shapes we have seen, these usually fall in the neighborhood of 1.4 to 1.5-something. The more conical heat shield and aeroshells JPL used on its smaller Mars probes have drag coefficients nearer 1.7, but a smaller nose radius that raises local stagnation heating. Half a metric ton (500 kg) on a 4 m diameter heat shield (12.57 sq.m) with a CD of 1.7 would calculate as ballistic coefficient 23.4 kg/sq.m. That's a low ballistic coefficient, with a high end-of-hypersonics altitude during entry at Mars. Somewhere above 20 km. A 6 ton object with a 3.7 m heat shield diameter, and a 1.5 drag coefficient (similar to Red Dragon) would have a ballistic coefficient of 372 kg/sq.m, which is very high for entry at Mars. It would come out of hypersonics close to the surface (under 5 km), with no time to deploy a chute, much less have it provide any significant deceleration. That's why the proposed Red Dragon design used supersonic retropropulsion, not chutes at all, in its landing. For repeat-pass aerobraking instead of propulsive braking, you have much more decelerative effect at low ballistic coefficient. The high-coefficient objects just "barrel right on through" without as much decelerative effect of drag. The folding and inflatable heat shield concepts that Spacenut pointed out are the means to reduce a large object's ballistic coefficient, by adding lots of blockage area for little added mass. The trick has been, and still is, figuring out how to make such a lightweight structure survive at such extreme conditions. That's what the testing will help determine. You are right about the atmospheric model. I found out it gives a false values for high altitudes some time ago, so I corrected it with some reference data found on internet. Now it gives similar values to the ones posted on your blog. It is not exactly the solution from your site, but the difference is very small and i think drag calculations for objects in my simulation are quite good. I know how the ballistic coefficient alters the trajectory of the object and how to change the relations so they would suit my needs. The problem is - when I apply those values to the object, the drag force and so the trajectory are good with the data in that pdf, but to get the same heat graph ploted using: q=k*sqrt( ro(alt) / Rn ) * v3 I need to input Rn = 8m (!). Edit: Sorry! I hasted the post and divided the value by 1000, not 10000 when (W/m2 to W/cm2). I run the program again - it turns out to get the value in rage of 100W/cm2 the Rn is 0.12m - the screenshots not updated - the graph just scales). I uploaded the screenshot for reference. The first one is the pdf example. The second is an objects with m =350t, A=64m2, Rn=8m. The last are both runs in single graph. Object data are shown in the bottom right window, the graphs as in the pdf are on the bottom. To get the values on graphs there are 2 grayed out boxes under each graph - first is the max value, second the min (sorry - the software is still in development). For other important data: the Apogee and Perigee are given after the aerobrake! (Perigee before the atmosphere entry is in rage 21km-23km but since the objects slows downs before and after the lowest point it changes). You may have noticed that for the heavy object the v0 = 5000m/s, not 6000 like in the pdf. You seem to have some sort of computer model of this aerobraking process that I don’t have. The results look plausible. Based on your edit, it looks like you resolved the aeroheating well enough to proceed. You may need to use a fake nose radius to get otherwise realistic results. That correlation was originally developed in the 1950’s for conical warheads with rounded-off points that entered pointy-end forward. It worked well enough for 1960’s-vintage capsules featuring blunt heat shields that were a segment of a sphere in shape. I don’t think many folks use it anymore, because there are more modern correlations developed for more pertinent shapes. A lot of that was done in the 1970’s leading up to the space shuttle. I don’t have any of those. However, the ancient correlation I do have would still apply to the more-conical heat shields JPL uses for its Mars landers. Those are cones with a nose radius, like the warheads, just very much broader in shape. They accept the higher heating at small nose radius to get the higher drag coefficient that reduces ballistic coefficient a little further. Your densities at aerobrake altitudes look pretty realistic. They seem near what I got from the Justus and Braun reference. Try arbitrarily halving and doubling them to see what Martian variability does to your trajectory. If you can still make it work with that kind of variation going on, you are “good to go”. To answer your question about parabolic approach, if your interplanetary trajectory is a min-energy Hohmann transfer ellipse, that leaves you with the least velocity at entry interface altitude. It will be a little bit above escape speed (near 5.3 km/s vs 5.0 escape), so the approach is actually hyperbolic, not parabolic. If you use a higher-energy interplanetary transfer orbit, your speed at atmospheric interface will be much higher, probably above 6 km/s. I’ve seen numbers as high as 7.5 km/s talked about. You probably don’t want anything to do with those faster trajectories, if you want to attempt aerocapture. Well, this computer model is mostly the equations from your blog encoded with c++ instead of spreedsheet for better presentation. I written it myself so this may be considered more by hand calculations that proper FEM. The heat load seem to differ a lot with just a minor shape change. The thing about the speed at atmospheric entry is very worrying. Is there no way to reduce the relative Mars-object speed at entry to 5000 m/s? Above this speed the aerocapture is no go for the heavy loads with my current BC, so some burn will be required to reduce the speed. Also the whole analysis as for now gives this conclusion: The minimal heat protection for any valid design with heavy loads must use the multi-use heat shield equivalent to 4,2mm PICA layer (this seems to be not reusable protection). For now the assumption is that covering the whole front area of spacecraft with reinforced carbon-carbon is sufficient heat protection to deliver heavy loads to Mars (ballistic coefficient below 1000 kg/m2 - speed 5300 m/s, periphrasis 20-22 km). Yeah, all those correlations are sensitive in one way or another to nose radius. It was true for the warheads, too. There's no way around that. Blunter really is better, even today, in terms of stagnation point heating. The lecture pdf file looks to be a fairly good resource for possibly better equations. I remembered the names Lees, and Fay and Riddell, from graduate school, but I have not seen that stuff in over 40 years now. I downloaded that one. Thanks. If speeds over 5 km/s are too much, then, yes, you will have to do a bit of a deceleration burn to get down to a speed at entry that really will work. No way around that, either, to the best of my knowledge. PICA and PICA-X are indeed ablatives, but they are capable of multiple exposures. PICA-X is the version made by Spacex, based on a NASA PICA material no longer made. I'm not sure, but the inch or two they use on Dragon is good for 1 well-above-escape entry at Earth, 1 maybe 2 entries at Earth coming from the moon, and maybe 5-ish+ re-entries from low Earth orbit. Any of those entry sequences have more heating exposure than what you are talking about, doing aerocapture at Mars. The V^3 term makes a huge difference.